We are automotive professionals, we love keeping our clients' cars safe and trouble free. We want every client of ours to feel comfortable when getting their vehicle serviced here. Our goal is to take the fear out of auto service. We work hard to take care of our clients' vehicles quickly and correctly. In doing this we are setting a new standard in the automotive industry, for quality of customer service and repairs. We work every day to improve all aspects of our service. Please let us know if there is anything that does not meet your expectations or if you have a suggestion to help improve our service. We wish to develop a personal relationship with each and every client, and want to exceed your expectations of what an automotive service facility is in every way. 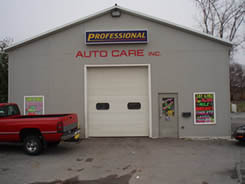 We realize that when it comes to automotive service you have a choice and we thank you sincerely for choosing Professional Auto Care for your vehicles' needs.